Gun Owners Group: The Liberal Media Encourages Mass Shootings In Schools In Order To Achieve Gun Control - Joe.My.God. You know, when I was growing up, the kids carried guns to schools, including semi-autos, and no one really thought anything of it. What you have now is you have gun free school zones, all of the sudden you have these school shootings and you have a liberal media that tries to turn these shooters into heroes. It lionizes them, it publishes their diaries, it puts their pictures on the front of the New York Times. As a result you have now a series of media-generated copycat shootings, which I’m afraid are not going to stop until one of two things happens: an armed citizenry rises up against these people and stops them or, alternatively, the media becomes so bored with this topic it stops trying to encourage copycat shootings in order to achieve gun control. 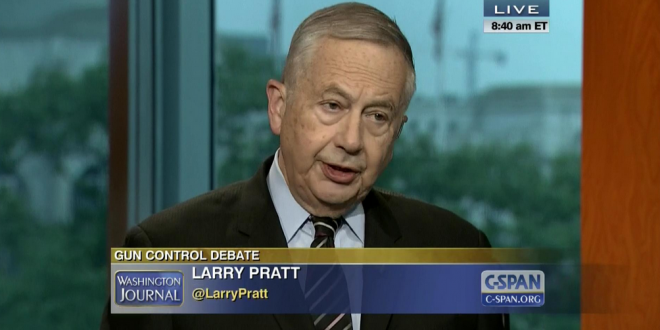 RELATED: In June 2016, Larry Pratt declared that if Democrats were to win to the White House, his group might have to resort to the “bullet box.” In 2013, Pratt was one of the headliners at crackpot lawyer Larry Klayman’s rally to overthrow the Obama administration.